Team Smoothie Recipes — and Free Giveaway! Annmarie Skin Care > DIY > Team Smoothie Recipes—and Free Giveaway! Do you love to feel nourished, energized, and sport a healthy, radiant glow? Then you must love smoothies as much as we do! If you haven’t tried a healthy and delicious green smoothie before, then you are in for a treat! In the mornings at the Annmarie Gianni skin care headquarters, many of us arrive to the office with our mason jars, filled to the brim with our favorite blends of fruits and veggies. Who needs coffee? Am I right? (Okay, maybe a few of us can’t live without our lattes). Help you feel proud for being so good to your body! Remember, if you want your smoothie to be healthy and nutritious, keep the alkalizing greens dominant (anywhere from 60-80%). The fruits added should give it the sweetness needed to make the greens tastier and easier to get down (for those who are new to drinking their greens). Otherwise, too much fruit may send your blood sugar levels to the moon. Don’t get me wrong—indulging in fruit smoothies can be a delicious way to treat yourself from time to time, but if you’re looking for wellness and nutrition, green smoothies are the way to go! Here is a round up of some of our favorite smoothie recipes, which will help you sip your way to health and a glowing completion. For details on the giveaway, see below! This is refreshing and green-o-licious. The garlic will give it a kick and keep your immune system humming! Instructions: Juice the cucumber, celery, kale and garlic. Then blend on high with the cilantro and watermelon. Enjoy! Instructions: Place all ingredients in a high-speed blender. Blend, enjoy and have a wonderful morning! *Feel free to cut this recipe in half if you only need one-two servings. Instructions: Place all ingredients in a high-speed blender. Blend and get ready to conquer the world! Instructions: Place all ingredients in a high-speed blender. Blend, enjoy and restore those muscles! Instructions: Blend all of the above ingredients in a blender and then pour into a large cup that has about a tablespoon of raw tahini smeared on the sides. On top of the finished smoothie, drizzle raw honey and a dash of cinnamon and bee pollen. Voila! This will hold you over and make you feel great for quite some time. Instructions: Add all ingredients except chia seeds and blend. Adjust milk to your thickness preferences. Add chia seeds after, and give them a couple minutes to get all gelatinous before you guzzle. Smile because you're enjoying chocolate and it's not bad! Experiment by substituting frozen strawberries or even oranges for the banana. Instructions: Place all ingredients in a high-speed blender. Blend, enjoy and feel beautiful! Instructions: Place all ingredients in a high-speed blender. Blend and enjoy! Instructions: Add lettuce and water into a high-speed blender and blend until smooth. Then add the rest of the ingredients, blend and enjoy! We hope you enjoy our team smoothie recipes! Feel free to indulge in any of these smoothies for breakfast, as an afternoon pick-me-up, or to help you body recover post-workout. Also, have fun and experiment with adding your favorite fruits, veggies and supplements to your smoothie and both your taste buds and your belly will be thanking you! Enter for Our Giveaway! 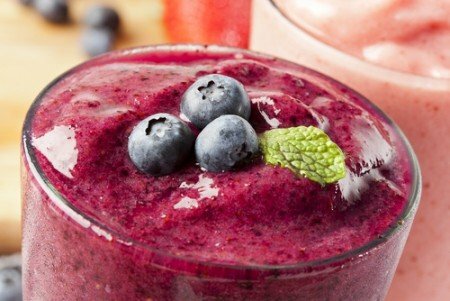 Submit one of your favorite smoothie recipes! Have a favorite smoothie recipe you’d like to share? Feel free to add your recipe in the comment section below and we’ll pick a winner to receive a copy of Renegade Health’s “Smoothie Recipes for Optimum Health” Book! No need to core the pineapple if you use a decent blender…lots of nutrition in the core, same with apples.. Always fresh ingredients and organic when possible….Enjoy! Make sure all those ingredients are organic. It will also good for immunity and muscles building. Thanks, Marie! That sounds divine! Really, we can use kale leafs for smoothie? Can’t amazing it’s taste. will try. to maintain an alkaline base to avoid arthritis and the onset if diseases.